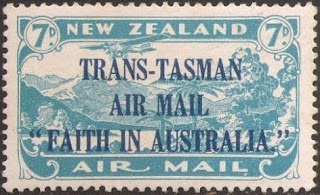 In 1934, New Zealand issued an overprinted airmail stamp celebrating the first official air mail flight between New Zealand and Australia. 83,078 stamps were issued, and Scott '11 values the unused stamp at $50.- and the used stamp at $55.-. 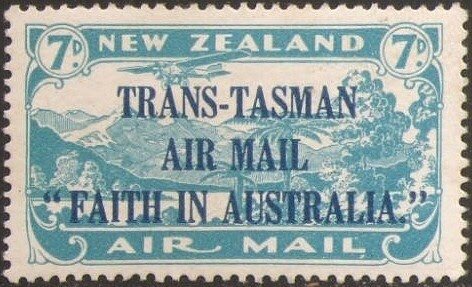 I view the stamp as an attractive investment because it has multiple market appeal to collectors of New Zealand, Australia, British Commonwealth, and Aviation topicalists. Many of the stamps that were used may be found on Flight covers, which are also desirable. New Zealand is a modern, prosperous nation of about 4.3 million people, with a GDP of $115 billion. Over the last 10 years, annual GDP growth has averaged about 3%. The economy was hurt by the recent global financial crisis, and is beginning to recover. In 2005, the World Bank praised New Zealand as being the most business-friendly nation in the world. Stamps of New Zealand are collected both domestically and by British Commonwealth collectors worldwide . The nation has a stamp collecting demographic similar to Great Britain's, and the demand for better material should increase dramatically as population aging accelerates. The percentage of New Zealander's aged 60 and over will rise from 18% in 2009 to 29% in 2050.